Last Year Advent Calendar Interviews! ANIMATION SUMMARY: Based on the 2014 April Fools prank. Bug Eye McGee, Count Von Roo, and the Kreludan Defender Robot are sitting around a table. Bug Eye McGee angrily throws a dart at a dartboard with a picture of Rosie taped on (part of that year’s prank was Dr. Death was retiring and players were asked to vote for a new Pound director out of the four. Rosie won but, being an April Fools prank, it was revealed Dr. Death wasn’t retiring after all (though Rosie was made overseer of the Pound Board)). Rosie walks in and everyone looks up at her, the camera than panning out to reveal they have somehow been put into a prison cell; assumingly inside the Pound by Rosie. Bug Eye McGee: It all started on April first, April Fools Day. I, these two swabbies, and the gal who I will not say by name, were roped into helpin’ with that year’s prank. Dr. Death was tricked into takin’ the day off as everyone else was told he be retirin’ and the Pound be closed for a while. We start handin’ out names of the Pound inmates to "foster" Neopians and tell ‘em to vote fer one of us. Are any of you goin’ to jump in or just stand there like an abandoned anchor? Count Von Roo: I guess I’ll continue since you asked SO kindly. Yes, everyone was told to vote for one of us and somehow that pink frilly dressed Grarrl with the freaky dance won over me! Sure, it was just for an April Fool’s prank, but come now Neopia, I, the great Von Roo, was a choice! Oh whatever, back to the story. At the end of the day it was revealed Rosie won but it was just a prank so it didn’t matter. We all went home and at least I thought that was the end of it. What have you to say, you automated monstrosity. Kreludan Defender Robot: CORRECTION. I AM AN S-SERIES, MODEL 750 KRELUDAN DEFENDER ROBOT. ACCESSING MEMORY BANK TO CONTINUE STORY. ON THE FIRST OF THE MONTH OF GIVING, NEOPIAN YEAR SIXTEEN, WE GOT AN INVITATION FROM THE FEMALE GRARRL NAMED "ROSIE" TO HAVE A "TEA PARTY" TO CELEBRATE AND RECONCILE. WE WERE TOLD TO GO TO THE POUND ON THE SECOND OF THE MONTH. I DECIDED TO GO IN ORDER INVESTIGATE AND RECORD THIS ODD BEHAVIOR. Bug Eye McGee: AYE! You’re makin’ me ears ring with all that yelling! Take it down a notch. Anyway I just wanted to add that I went since I actually wanted to be courteous and show I had no gripes between us, unlike the count here. Count Von Roo: Bite your tongue! By then I honestly completely forgot about the event and found the invitation humorous so I thought I’d humor her and go along with it. But as it turned out it was a trick! We met Rosie who directed us to a room where we saw she set up a table. After we went in she then shut the door on us! The nerve! Kreludan Defender Robot: SHE RECOUNTED TO US SHE WANTED TO PULL A PRANK ON US FOR APRIL FIRST. HOWEVER SHE DIDN’T HAVE THE CHANCE TO SINCE SHE WON AND WAS MADE BOARD OVERSEER. SHE WAS SCHEDULED FOR A DAY OFF ON THE SECOND OF THE MONTH OF GIVING AND THOUGHT THIS WOULD BE THE PERFECT TIME TO PULL HER BELATED PRANK. IT WAS NOT AMUSING. Bug Eye McGee: Sure wasn’t. Kept us in there all day and told everyone she could about it. We spent almost the whole day in there until Dr. Death let us out that night. The gal had gone right home a while ago, probably not wantin’ to deal with our wrath. We agreed it would be for the best that we just go home. Count Von Roo: But don’t confuse that for mercy. Because I have a plan, a plan that would make her wish she didn’t pull the cape over the eyes of NEOPIA’S MOST POWERFUL VAMPIRE! Kreludan Defender Robot: THIS UNIT TOO HAS A REVENGE PLAN. MASTER HAS PROGRAMMED ME TO KNOW ALL ABOUT AND HOW TO EXECUTE REVENGE. ANIMATION SUMMARY: Fyora is looking at a portrait of Faerieland when it was back in the skies. She looks outside of her balcony and gives a sad sigh seeing Faerieland on the ground. However she than sees her fellow Faerie sisters decorating Faerieland for the holiday, putting a smile on her face. WHAT HAPPENED: I don’t know how to say this without sounding selfish, but at times I do feel I’ve failed my sisters as their queen. Xandra was mad at me and I underestimated how far she would take her ambitions. As a result we were all turned to stone and Faerieland fell from the sky. Though reconstruction has been going well we don’t have anywhere near the amount of magic we once had and aren’t able to lift Faerieland back into the sky. All this weighs heavily on me and, though I persevere, it doesn’t change the sadness in my heart. I was having one of those times, but then I say my sisters joyfully decorating Faerieland as they’ve always done. Seeing it not only eased my sadness but also reminded me I should enjoy what we have and enjoy it together with my sisters. It’s a lesson I think we can all attest to in some degree and should embrace. ANIMATION SUMMARY: We pan across a table of Neovian citizens who are covered in food. Madam Salt points to a spot on a chalkboard with a grid on it as a Brown Quiggle fires a cannon filled with food. Cut over to another table of Neovian citizens who Baron Goldnose is with. As he points to his own chalkboard with a grid the fired food than splatters all of them. We get a bird’s eye view and see both groups are seated like they’re playing Coal War Tactics. The Quiggle who fired the cannon was looking through binoculars and gives a nod to Madam Salt who puts another "x" on her grid. WHAT HAPPENED: Oh it was a rousing good time! Though you did not see me I was there; someone had to monitor the game and these suits are quite expensive to clean. You see, every Month of Giving, Madam Salt and Baron Goldnose put their rivalry aside to have some friendly meals. However they had a furious argument a week before last year’s Month of Giving and thought any attempt to have a meal with one another would end in a food fight. That’s when they got the idea of a way to honor their tradition but also blow off some steam. This is where I and the Spooky Shindig Society came in. They came to us suggesting a Neovian Food Fight Coal War game with Neovian citizens instead of mine carts and food instead of dynamite. We thought it was an interesting and fun idea so we agreed to fund and organize it. It was a huge success and we’re seeing if we could turn it into an annual event! Maybe even invite other residents of the Haunted Woods or Neopians from all over Neopia if I be so bold to speculate. ANIMATION SUMMARY: A White delivery Weewoo and a Darigan delivery Weewoo are walking down the same path when they bump into each other. They drop their packages and unknowingly pick up the other’s package. The White delivery Weewoo delivers its package to King Skarl who opens it only to get surprised by a Darigan Angelpuss springy toy and gets angry. Meanwhile Lord Darigan got the other package and confusingly stares at what it contained: a portrait of King Skarl. WHAT HAPPENED: Ugh, don’t remind me of that! I thought the Darigan Citadel was trying to declare an act of war on Meridell due to that mix up! I never had any problems with the Weewoo Delivery Service before, I pay for the first class service after all, and I was eagerly waiting for this package in particular. I’d say it almost ruined my whole holiday if they hadn’t fixed it within a day and given me a discount on my next delivery. Huh? You want to know why I was being given a portrait of myself? Well that portrait was drawn by a very famous artist, Buzz Rozz, and was a lot of NP to get made. 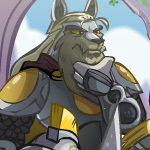 I actually have a collection of portraits of myself drawn by many of Neopia’s influential artists; it’s a hobby of mine. WHAT HAPPENED: While confused at the time, which I believe would be understandable, thinking back to it now it’s quite humorous. The toy was a gift from a Darigan Citadel child; I get a lot of them during this time a year. The Darigan children love trying to find new ways to surprise me and I appreciate their creativity and resourcefulness to bring me some levity. So imagine my surprise when I was expecting a tiny fright when instead I got a portrait of Meridell’s king. I thought it was from him at first, King Skarl does like to gloat and sending portraits of himself as gifts seems like something he’ll do. But no, after putting it aside to find a place for later a White delivery Weewoo came to me with my actual package and pleaded for me to return the portrait. I know King Skarl doesn’t find this incident funny but considering the different cultures and him expecting a certain package I can understand his agitation. Still, I prefer to find the humor in such incidental things, especially around the holidays. ANIMATION SUMMARY: King Altador is looking around the Hall of Heroes which has been decorated for the holidays. Every statue has been decorated except for the pedestal where the Darkest Faerie’s statue once stood. Sadden, King Altador than places a flower on her pedestal. WHAT HAPPENED: It’s a tradition I started ever since Altador returned. As many may recall her statue needed to be destroyed to lift the memory blocking spell. Her pedestal has remained bare ever since, no one really wanting to make another statue of her even when I ask them personally. Every Month of Giving the Hall of Heroes is decorated by our staff and several lucky Altadorains chosen by said staff. They decorate our statues to show their love and honor to us which I am grateful to them for. However, no one ever chooses to decorate the Darkest Faerie’s pedestal. I don’t blame them; only the very young don’t know about her betrayal and most feel anger toward her. And while I too feel anger toward the Darkest Faerie, the anger comes from a place of sadness. Not many knew the Darkest Faerie as I and the other Council Members have. She had a good heart; she was a friend who helped built the city of Altador alongside us. I choose to remember the good times, I suppose since I feel her corruption was slightly my fault though I know I had done nothing wrong. But that’s why I place a flower on her pedestal, a flower for a fallen friend. I know a few other Council Members who also place a flower such as Jerdana and Siyana, but they always wait for me to place the first one. ANIMATION SUMMARY: MAGAX has a pick hammer lifted high up, ready to strike. The ghost of Hubrid Nox looks surprised and frightened. Then its revealed MAGAX is actually carving a decorative headstone for Hubrid Nox, his ghost amused as it’s finished. WHAT HAPPENED: I know what you’re thinking. Didn’t I swear to keep Hubrid Nox’s ghost at bay no matter how many times he rises? Well let me ask you this? How many times until enough is enough? I’m telling you I was about to go mad from having to keep chasing after Nox’s ghost for twenty four hours, seven days a week. Yes I swore vengeance but at the same time I was hoping maybe I could move on with my life now that Nox was gone. I suppose Nox’s ghost sensed this, Nox likes toying with me but I guess he too was getting tired of the chase. He told me that he would make peace with me and lay for a long rest if I made a more decorative headstone for him. I agreed even though I felt this was a trick, but Nox had kept his word. For a year now he hasn’t bothered me, I’ve been able to do several things this year I couldn’t have done had I been chasing after Nox. I’ve met up with my fellow Brute Squad brothers to participate in Battleground fights, mastered a few spells, offered my ghost slaying services to others in need, and had made contact with some higher ups in Faerieland who agree to see if the Faeries are willing to forgive me. I’d say it’s been a pretty good year, yet I think it has made me more nervous as I just have this feeling that Nox is planning something and all I had set out to do will fall apart or be used against me somehow. Excuse me, I gotta focus my mind on something before I let my paranoia get to me. ANIMATION SUMMARY: At a party, Hannah and a Pink Xweetok are wearing the same dress. Loic, from NC Mall’s Dyworks, uses a Hue Brew Potion to change their dresses to different colors, fixing this fashion faux pas. WHAT HAPPENED: Oh that? I was invited to a party, nothing too surprising considering my status as world renowned treasure hunter and Neopian hero. However it was a bit more of a ritzy party so I needed a dress and used my contacts to get a fashionable dress not yet available to the public. I mean I can’t be showing up in any old dress and risk wearing the same thing as someone else, right? Well my strategy backfired on me as the daughter of the dress creator also got invited to the party and she chose to wear the same exact dress! Very embarrassing, more so since this wasn’t even a released dress so that drew in much more attention than had it been a dress I bought off the shelves. Luckily the NC Mall Dyworks Tonu, Loic, was also a guest and he always carries around a bottle of his Hue Brew Potion for just such occasions! So awkwardness averted, however I think next social party I’m going to get a tailor made dress, been meaning to get one but treasure hunting isn’t an idle activity. ANIMATION SUMMARY: Bonju is cooking when a Nimmo walks up to him and hands him a piece of paper. Bonju reads the paper and nods. Bonju than cooks up something in a giant pot and magically a Gingerbread Dandan comes out of it. WHAT HAPPENED: Just a simple order from the Petpet Protection League, that’s all. While I don’t fully understand why the PPL would want a Petpet made out of something edible, seems to go against their objective, I don’t make it a habit to question a customer’s request... complaints are another story. I can still see you’re confused so I guess I need to further explain. Being Shenkuu’s premier cook I sometimes get asked to help in some odd creations. While I excel at cooking I know a little about potion making and medicine as well because of this. And being the local cook and the PPL deciding it should be a Shenkuu Petpet to receive a culinary holiday treatment they came to me. It’s a simple as that. Hm? A recipe for my Magical Cooking Vessel? HA! Don’t be ridiculous! I could have done that in my sleep! No, my Magical Cooking Vessel is for something far more important you’ll just need to discover for yourself. ANIMATION SUMMARY: Dr. Landelbrot is performing an experiment which uses his confusionator ray to create a Christmas tree with all red ornaments. Surprised by this, he writes down the results and fires again to create a Christmas tree with all green ornaments. Angry, he writes down the results and fires again creating a Christmas tree with all blue ornament. Furious, he writes down more notes and fires again to create a robotic Christmas tree. Dr. Landelbrot is happy with the result as the camera pans away to reveal the back of his ship filled with single colored ornament Christmas trees. WHAT HAPPENED: Truth be told I was trying to create a normal Christmas tree with multi-colored ornaments. Why spend your time finding a tree, chopping it down, dragging it home, and decorating it when you can simply create one in an instant with a zap? Well I think had I just gone out to get a Christmas tree like everyone else it would have been faster than trying to create one. Who would have thought trying to make the ornaments multi-colored would be the hardest part? Every slight adjustment either made all the ornaments red, green, or blue; no other color, and never mixing the colors. I eventually got so frustrated I reversed all the switches, set all the dials to max, pressed all the buttons and fired the ray. Admittedly not the most scientific method but I couldn’t complain with the result. May not be what I wanted, but I think it might have been what I needed. This year’s experiment involves making fruit cake edible... the results so far have not been pretty. ANIMATION SUMMARY: A snowflake is seen gracefully falling until landing on a wheel of cheese. The camera than pulls out to show several Neopians gathering to have an outdoors holiday feast including famous ones such as Armin, Kanrik, King Kelpbeard, and Horace. WHAT HAPPENED: That was my end of the year holiday party! I only started doing them a few years ago, but they’ve always been a great time! It started with Hannah and Kanrik always trying to make it to Terror Mountain for a holiday meal during the Month of Giving with me, the Keeper of Time, and all the other Bori. Well I then started travelling around and made new friends along the way. I felt it wouldn’t be fair not to invite them so I decided that at the end of the year I would invite my new friends, along with Hannah and Kanrik, to a big end of year holiday party! This year I travelled through the Lost Desert where I met Horace and visited Maraqua where I got an audience with King Kelpbeard. Surprisingly Kanrik was able to attend, the Oracle gave all Factions the week off, but sadly Hannah wasn’t able to. She met someone from Neovia at a fancy party and was told about some catacombs filled with riches. Well you know Hannah, she hears treasure and she’s off. She said she got lost down there, constantly getting hit with curses which made her fatigued for hours. By the time she got out it was the beginning of the next year already! But she came out with a ton of treasure and sent a batch to me as an apology. I was sad she couldn’t come but glad she’s alright and didn’t forget about me, besides there’s always next year! ANIMATION SUMMARY: The Unfortunate Holiday Ogrin is sledding down a hill. He then suddenly sees a log appear in his path and swerves into a bush to ignore hitting it; the bush covered in mistletoe. Nearby a female Mutant Gnorbu sees he has mistletoe hanging over him and she goes to kiss him, much to his horror. (NOTE: Despite the ending of the animation showing the Unfortunate Holiday Ogrin horrified, the gifts for that day revealed he and the Mutant Gnorbu later got married). WHAT HAPPENED: And that’s how I met my wife! I’d say it’s the luckiest holidays I ever had, even if we did meet in the strangest circumstances. I’ve never had much luck during the holidays, I don’t know why. Around the holidays I just find myself getting into all sorts of accidents and misunderstandings. The year before this one I was short on cash and wanted to be painted a new Colour. I then suddenly get sprayed and I’m a new Colour! However it wasn’t magical paint and as soon as a pile of snow fell on me it cleaned the paint off. That was disappointing. But what started as yet another bad holiday experience turned into one of my greatest. I decided to spend one holiday on Terror Mountain, thinking my bad luck was just because I was in the city. Well I was wrong, first time sledding and I had to swerve out of a way of a log and went right into a bush of mistletoe. But that’s when I met her. As she would later explain to me, Mutant Neopets have a tough time finding love and she’s been looking for a while. When she saw me she thought I was one of those Neopians who goes around with mistletoe looking for "free kisses". After I explained what happened she felt embarrassed but I told her it was alright. We hung out together that holiday and quickly became friends, getting to know each other better. She’s very intelligent and has an optimistic personality, she just have some abnormal tastes in food and style. Over the course of a few months we than became a couple and a few months later we decided to get married. It’s odd how things work out sometimes, but I wouldn’t have had it happened any other way! The Advent Calendar’s animations each tell their own little story, but some of these little stories are part of a bigger one. While visiting this year’s Advent Calendar why not think about if there’s a story behind the animations or even the gifts given. And if you’re looking for more fun animations, you can check out the Advent Calendar Animations Archives to see all animations from the past! With that in mind, enjoy the rest of the Month of Giving and the Advent Calendar!